If I were to tell you that a race that was incredibly hot and hilly could also be an absolute blast, would you believe me? I hope so, because somehow the Runner’s World Heartbreak Hill Five & Dime races managed to be sweaty, challenging, sunny and FUN. 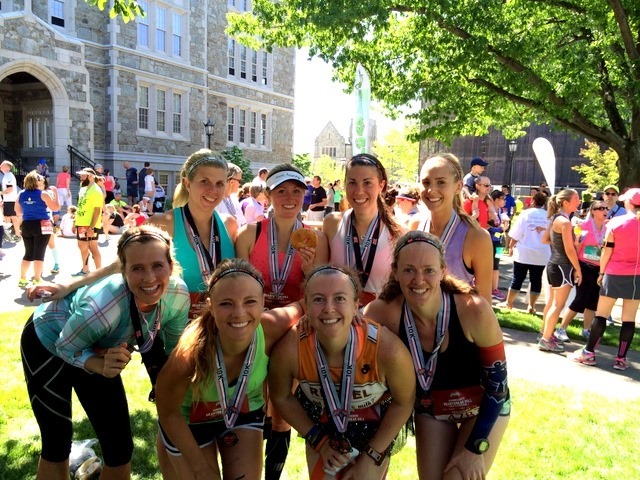 When I arrived at the start line of the Runner’s World Heartbreak Hill 5K, I realized something that made me feel like maybe I did belong there. I was surrounded by runners of ALL different abilities. 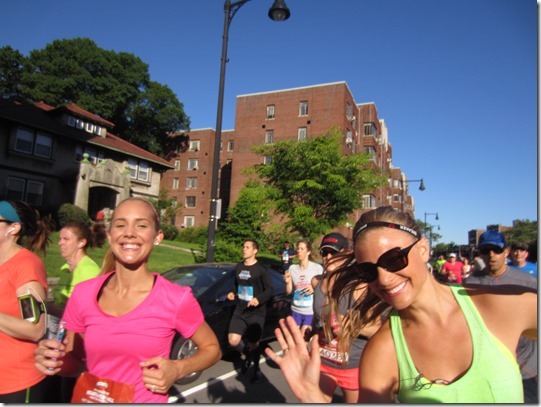 Most of us out there on race day morning aren’t super speedy. We aren’t running to break any records (other than our own!) 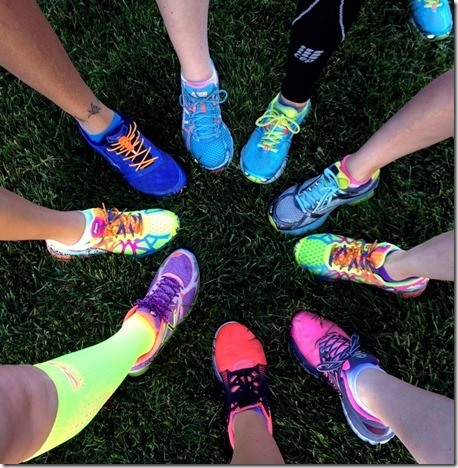 and we simply run for the joy of running and the benefits – both physical and mental. I think I feel the need to share this with you guys because I know that many fitness-focused bloggers are fantastic runners and if we get sucked into the comparison trap, we can quickly feel inadequate about our running abilities. These bloggers are incredible and inspirational… but it’s okay if you’re not like them. If you want to run, DO IT. The beauty of running, and what drew me to it back in 2007, was the simplicity of running and the ability to see progress if you commit to it. 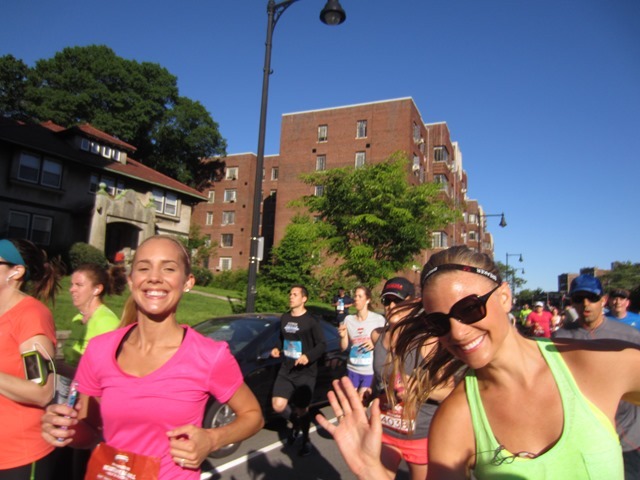 Prior to arriving in Boston for the race weekend, I registered to participate in the Five and Dime race – a 5K followed immediately by a 10K. 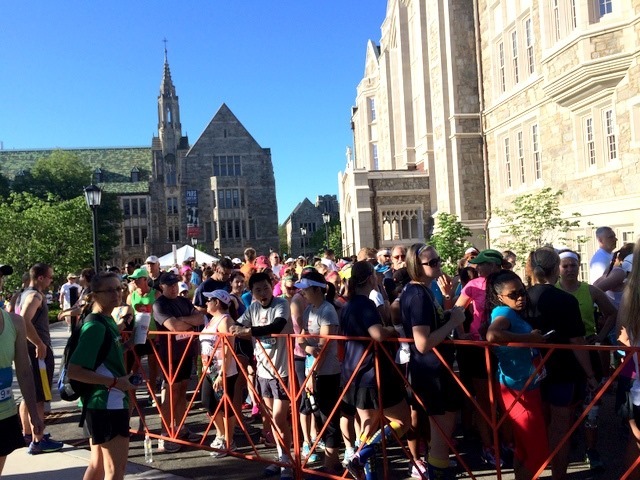 The 5K was the first race of the day on Saturday and after waking up and quickly inhaling at LUNA bar, some of my blogging buddies and I left our dorm rooms and walked to the start line conveniently located on the Boston College campus. 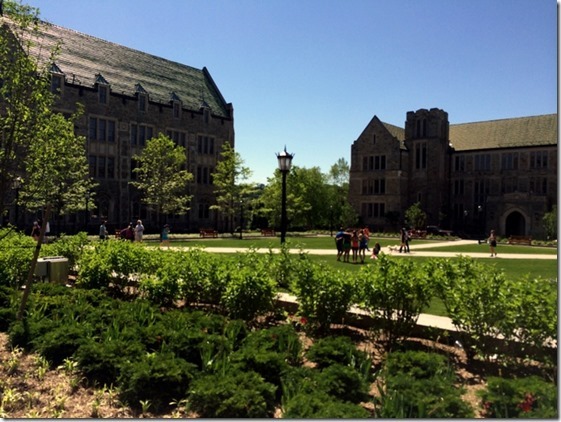 I loved the historic feel of the Boston College campus and was impressed with all of the gorgeous greenery! I wish I had more time to walk around and explore the area. 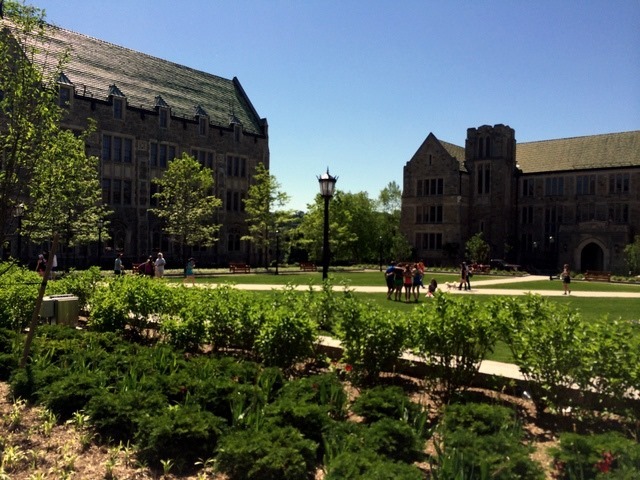 We made our way to Linden Lane and stationed ourselves in front of the Babst Art Library. 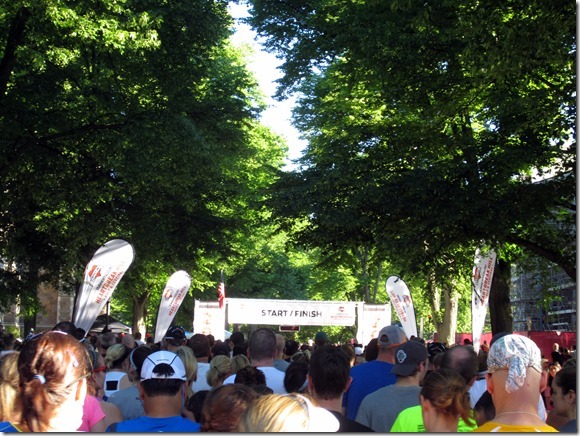 By the time we arrived at the start line, there were a ton of runners waiting by the various pace signs. Despite the large number of people, the race atmosphere didn’t feel hectic or incredibly congested which was nice. 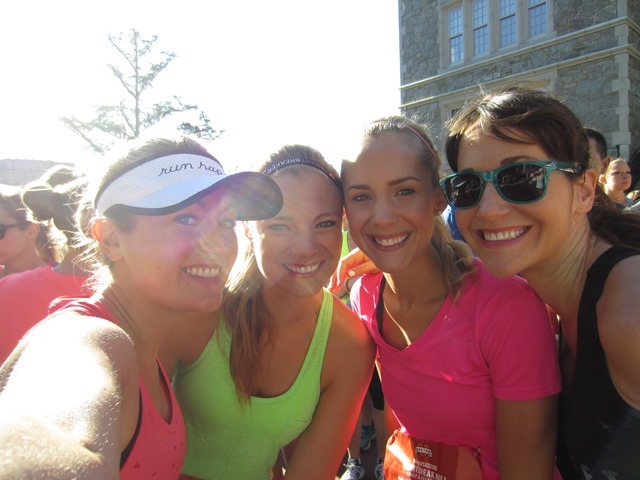 A little before 7:15 a.m., I lined up with four of my blogging friends, Anne, Dani, Presley and Marnie. The four of us didn’t really have much of a game plan going into the race but all vowed to take it easy and pace ourselves since we had another 6.2 miles to run immediately after the 5K. Before I knew it, I was running onto Commonwealth Avenue and the miles were flying by thanks to lots of chatting with my blogging buddies! If I could run with these women every day I would because they know how to make time fly! 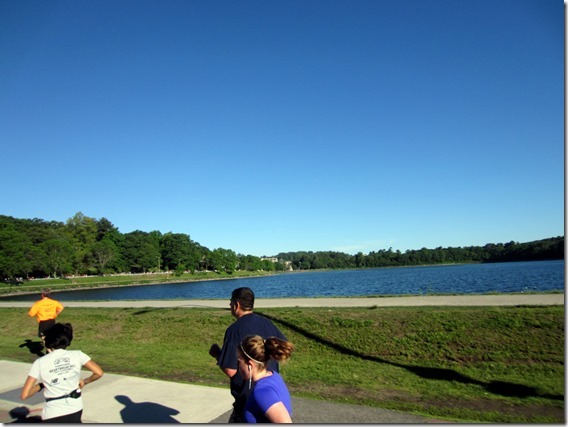 The most scenic part of the run took us along the Chestnut Hill Reservoir where runners were able to take in the beautiful views before running along Beacon Street. Our little group crossed the finish line in just under 30 minutes with a time of 29:53 (9:37/mi). When we crossed the finish line, a few of us wanted to make some wardrobe changes since it ended up being a lot hotter outside than we initially anticipated. I wanted to throw on some shorts instead of my capris and after a mad dash to the dorms to change, we made it back to the 10K with a minute or two to spare before it was time to run again! Changing into shorts was definitely a good decision. It was a hot race but thanks to running in Florida, I am relatively used to the heat. What I am not used to is running up and down hills! The 10K course was a challenging out-and-back that took us up and down the famous Newton Hills. We could tell right away that the course was going to be difficult and I knew I needed to save some steam if I was going to make it up Heartbreak Hill at the end of the race without crawling. I began the 10K with the same crew from the 5K but after about two miles, our group dispersed a little bit and Presley became my running buddy for the remainder of the race. She is so much fun and I’m pretty sure we didn’t stop chatting once during our run together. The two of us trucked along, cursed the hills and kept each other going. Presley totally made this race for me and she’s lucky I spared her 5,000 sweaty “thank you” hugs once we finally crossed the finish line! 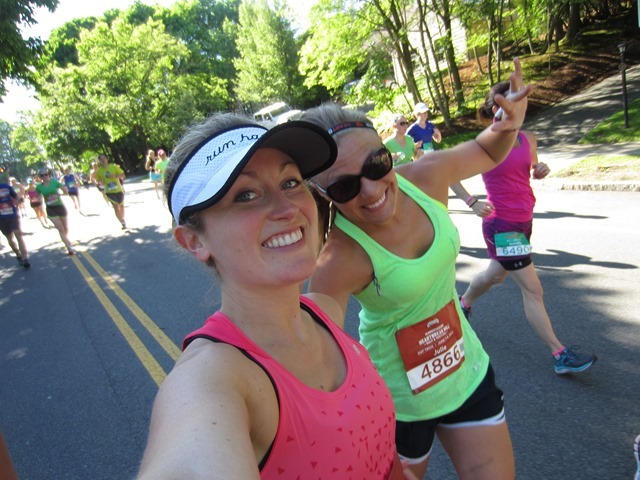 We both felt like we looked like Quasimodo as we tried our best to keep up our momentum on Heartbreak Hill. Our running pace turned into a sweaty shuffle but we kept going! I couldn’t help but think about all of the runners who have tackled that hill at the end of the Boston Marathon. You have my respect!!! The hill is intense and I and pretty sure I would fall over and cry if I came upon that hill at mile 21. Soon after we made it over Heartbreak Hill, we ran through the finish line and straight to the food tent! 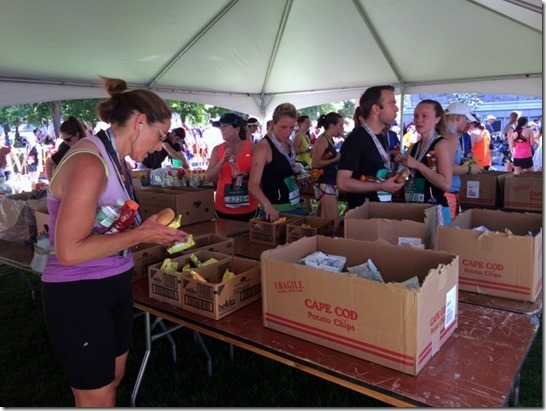 Once we refueled with bananas, bagels, chips and water, we met up with the Runner’s World bloggers and waited for more people to finish. 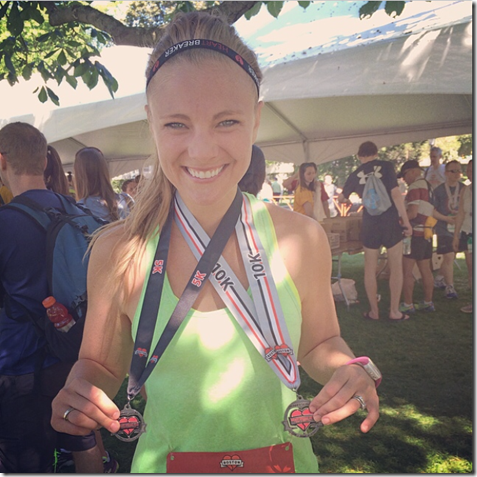 Two races = Two medals! The 5K and 10K races at the Runner’s World Heartbreak Hill Half & Festival were such a blast! I was challenged and inspired and thought the courses were beautiful. If you’re in the area next year, I highly recommend both the 5K and the 10K – or both for an added challenge! Some superstar runners also ran the Hat Trick and completed a half marathon the following day which thoroughly impressed me! 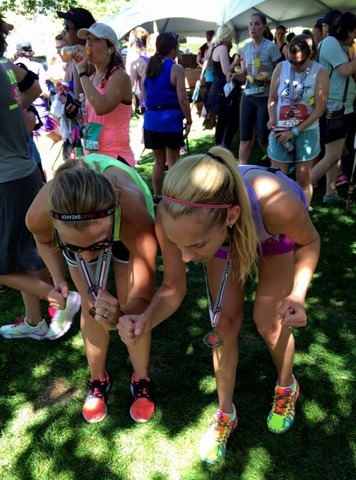 Big congrats to all of the runners last weekend! And thanks again to all of the blog readers out there who said hi and encouraged me along the course. I’m sure I looked like death out there but your positive words definitely motivated me and made me smile! Do you have any races coming up on your calendar? Oh man!!! Wish we could’ve run together! !